"Eurovision 2007" redirects here. For other uses, see Eurovision 2007 (disambiguation). Each country awarded 12, 10, 8–1 point(s) to their 10 favourite songs. The Eurovision Song Contest 2007 was the 52nd edition of the annual Eurovision Song Contest. It took place in Helsinki, Finland, following Lordi's win at the 2006 contest in Athens, Greece with the song "Hard Rock Hallelujah". 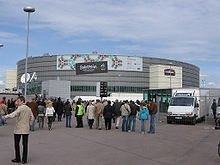 The contest was held at the Hartwall Areena in Helsinki, Finland from 10 May to 12 May, and staged by host broadcaster Yle. A budget of €13 million was presented for arranging the contest. Other bids to host the contest came from Espoo, Turku and Tampere. The hosts were Finnish television personality Jaana Pelkonen and Finnish musician, stage performer and actor Mikko Leppilampi. Krisse Salminen acted as guest host in the green room, and reported from the crowds at the Senate Square. A record number of 42 countries participated. The European Broadcasting Union (EBU) put aside its limit of 40 countries, which would have meant excluding some countries using a ranking order scheme. The winner was Serbia, appearing as an independent country for the first time. After Lordi scored the first ever Eurovision victory with a hard rock song, several countries sent rock songs to the Contest rather than the soft pop and schlager styles more closely associated with Eurovision. This trend continued at the 2008 and 2009 Contests. Cyprus and Latvia entered songs in languages other than their own or English. Although this happened with the Belgium 2003 entry, this was the first time the contest featured countries doing this with actual languages as opposed to an imaginary one. Hartwall Areena, Helsinki - host venue of the 2007 contest. On 12 March 2007, the draws for the running order for the semi-final, final and voting procedure took place. A new feature allowed five wild-card countries from the semi-final and three countries from the final to choose their starting position. The heads of delegation went on stage and chose the number they would take. In the semi-final, Austria, Andorra, Turkey, Slovenia and Latvia were able to choose their positions. In the final, Armenia, Ukraine and Germany were able to exercise this privilege. All countries opted for spots in the second half of both evenings. Shortly after the draw, the entries were approved by the EBU, ending the possibility of disqualification for the Israeli song. The United Kingdom chose their entry after the deadline because they were granted special dispensation from the EBU. The contest saw some minor changes to the voting time-frame. The compilation summary video of all entries including phone numbers was shown twice. The voting process was the same as 2006 except there was fifteen minutes to vote, an increase of five minutes on the 2006 Contest. In the final, the results from each country were once again shown from one to seven points automatically on screen and only eight, ten and twelve were read by the spokespeople. For the first time, the winner was awarded a promotion tour around Europe, visiting Denmark, Spain, Sweden, the Netherlands, Greece and Germany. The tour was held between 16 May and 21 May. The event was sponsored by European communications group TeliaSonera, and — as with several previous contests — Nobel Biocare. Apocalyptica were the interval act, and played a medley of songs: Worlds Collide, Faraway and finally Life Burns!, but without the usual lyrics. The official logo of the contest remained the same as 2006; the flag in the centre of the heart was changed to the Finnish flag. The European Broadcasting Union and YLE announced that the theme for the 2007 contest would be "True Fantasy", which embraced Finland and "Finnishness" in terms of the polarities associated with the country. The design agency Dog Design was responsible for the design of the visual theme of the contest which incorporated vibrant kaleidoscopic patterns formed from various symbols including exclamation marks and the letter F. The stage was in the shape of a kantele, a traditional Finnish instrument. On 20 February 2007 a reworked official website for the contest was launched marking the first public exhibition of this year's theme. An official CD and DVD were released (but no HD DVD or Blu-ray, despite the event being broadcast in high definition for the first time). An official fan book was also released. The themes of the postcards (short videos between the acts) were short stories happening in different Finnish places. Participating countries in a Eurovision Song Contest must be active members of the EBU. 42 countries submitted preliminary applications. Although in previous years the maximum number of participating countries was 40, the EBU allowed all 42 to participate in 2007. The Czech Republic, Serbia, Montenegro and Georgia all entered the contest for the first time in 2007. Monaco announced its withdrawal on 12 December 2006, and the EBU announced the final lineup of 42 countries on 15 December 2006. Evridiki returned to represent Cyprus, having previously represented the nation in 1992 and 1994. Eiríkur Hauksson previously represented Iceland in 1986 as part of the vocal trio ICY and he previously represented Norway in 1991 as part of the group Just 4 Fun. Karolina Gočeva previously represented Macedonia in 2002. Edsilia Rombley previously represented the Netherlands in 1998. The semi-final was held on 10 May 2007 at 21:00 (CET). 28 countries performed and all 42 participants voted. Countries qualified for the final are highlighted. 1.^ Contained some words in French and Spanish. 2.^ Although the song was performed in English, the title and sentence in the lyrics "Ven a bailar conmigo" is in Spanish. the top 10 countries from the 2007 semi-final. The final was held on 12 May 2007 at 21:00 (CET) and was won by Serbia. 3.^ Contained some words in English. 4.^ Song is entirely in english but the title is in Greek. All countries participating in the contest were required to use televoting and/or SMS voting during both evenings of the contest. In the event of technical difficulties, or if the votes of the country did not meet the EBU threshold, then a back-up jury's results were to be used. Albania and Andorra were the only countries that used juries. A draw was held in Helsinki to establish the order in which the countries presented their votes during the final. The table is ordered by appearance in the semi-final, then by pre-determined voting order. Vertically, the table is ordered by appearance in the final. Horizontally, the table is ordered by voting order. The Marcel Bezençon Awards were first handed out during the Eurovision Song Contest 2002 in Tallinn, Estonia honoring the best competing songs in the final. Founded by Christer Björkman (Sweden's representative in the 1992 Eurovision Song Contest and current Head of Delegation for Sweden) and Richard Herrey (member of the Herreys, Eurovision Song Contest 1984 winner from Sweden), the awards are named after the creator of the annual competition, Marcel Bezençon. The awards are divided into 3 categories; Press Award; Artistic Award; and Composer Award. Organisation Générale des Amateurs de l'Eurovision (more commonly known as OGAE) is an international organisation that was founded in 1984 in Savonlinna, Finland by Jari-Pekka Koikkalainen. The organisation consists of a network of 40 Eurovision Song Contest fan clubs across Europe and beyond, and is a non-governmental, non-political, and non-profitable company. In what has become an annual tradition for the OGAE fan clubs, a voting poll was opened allowing members from different clubs around the world to vote for their favourite songs of the 2007 contest. Below is the top five overall results, after all the votes had been cast. The Barbara Dex Award has been annually awarded by the fan website House of Eurovision since 1997, and is a humorous award given to the worst dressed artist each year in the contest. It is named after the Belgian artist, Barbara Dex, who came last in the 1993 contest, in which she wore her own self designed (awful) dress. The order in which each country announced their votes was determined in a draw during the heads of delegation meeting. The spokespersons are shown alongside each country. Although Australia was not itself eligible to enter, the semi-final and final were broadcast the event on SBS. As is the case each year, they were not broadcast live due to the difference in Australian time zones. Australia aired the United Kingdom's broadcast, including commentary from Paddy O'Connell, Sarah Cawood and Terry Wogan. Before the broadcasts, viewers were told by an SBS host that the Eurovision Song Contest was one of their most popular programmes. The final rated an estimated 436,000 viewers, and was ranked number 20 on the broadcasters top rating programs of the 2006/2007 financial year. Azerbaijan were willing to enter the contest, but since AzTV applied for active EBU membership but was denied on 18 June 2007, they missed the contest and had to wait until they were accepted. Another Azerbaijani broadcaster, İctimai Televiziya və Radio Yayımları Şirkəti, broadcast the contest. It was a passive EBU member at the time, and had broadcast it for the previous two years. It was the only non-participating broadcaster this year to send its own commentators to the contest. Italian television had not entered since 1997. National broadcaster RAI is in strong competition with commercial TV stations and believes that Eurovision would not be a popular show in Italy, although the 1991 edition (held in Rome) was followed by 6 million people. They have not broadcast the contest in recent years, although an independent Italian channel for the gay community has shown the show. Monaco broadcast the final on TMC after having withdrawn from this competition in December 2006, opening the possibility of returning for the 2008 contest. However TMC did not return in 2008. A live broadcast of the Eurovision Song Contest was broadcast worldwide by satellite through Eurovision streams such as Channel One Russia, ERT World, TVE Internacional, TVP Polonia, RTP Internacional and TVR i. The official Eurovision Song Contest website also provided a live stream without commentary using the peer-to-peer transport Octoshape. YLE produced the event in 1080i HD and 5.1 Surround Sound. This was the first year that the event was broadcast live in HD. The BBC in the United Kingdom broadcast the final in high definition on BBC HD. Swedish broadcaster SVT broadcast both the semi-final and the final on their HD-channel SVT HD. However the event is only available to buy on standard-definition DVD, with no HD DVD or Blu-ray version available in high definition. Eurovision Song Contest: Helsinki 2007 was the official compilation album of the 2007 Contest, put together by the European Broadcasting Union and released by CMC International on 20 April 2007. The album featured all 42 songs that entered in the 2007 contest, including the semi-finalists that failed to qualify into the grand final. ^ a b "Opening and interval acts known". esctoday.com. 13 April 2007. Archived from the original on 7 October 2011. Retrieved 30 May 2011. ^ "Eurovision EBU Press conference". esctoday.com. ^ a b "Eurovision Song Contest 2007". The Diggiloo Thrush. Retrieved 5 March 2012. ^ "Eurovision Song Contest 2007". EBU. Retrieved 30 July 2009. ^ "Marcel Bezençon Award – an introduction". Poplight. Archived from the original on 17 October 2013. Retrieved 2 June 2009. ^ "Winners of the Marcel Bezençon Awards 2012 | News | Eurovision Song Contest – Baku 2012". Eurovision.tv. Retrieved 9 August 2012. ^ "Eurovision Fanclub Network". OGAE. Retrieved 15 June 2012. ^ "Klubi-info: Mikä ihmeen OGAE?" [The club info: What on Earth is OGAE?] (in Finnish). OGAE Finland. 5 June 2012. Retrieved 17 June 2012. ^ OGAE International (2007). "OGAE Poll Results 2007". OGAE. ^ Viniker, Barry (12 May 2007). "The voting running order revealed". ESCToday. Retrieved 29 November 2009. ^ "Eurovision Song Contest Germany 2011 | News – Azerbaijan to debut in 2008?". Esctoday.com. Retrieved 30 May 2010. ^ "Imprimir". Normalitzacio.cat. Retrieved 9 August 2012. ^ a b c Christian Masson. "2007 – Helsinki". Songcontest.free.fr. Retrieved 9 August 2012. ^ "• Pogledaj temu – Prijedlog – Eurosong večer(i) na HRT-u!". Forum.hrt.hr. 27 March 2011. Archived from the original on 14 March 2012. Retrieved 9 August 2012. ^ Julkaistu To, 29 April 2010 – 10:19 (29 April 2010). "YLE Radio Suomen kommentaattorit | Euroviisut | yle.fi | Arkistoitu". yle.fi. Retrieved 9 August 2012. ^ "Dr. Peter Urban kommentiert – Düsseldorf 2011". Duesseldorf2011.de. Archived from the original on 24 March 2012. Retrieved 9 August 2012. ^ "Thomas Mohr: Mit Dschinghis Khan im Garten". Eurovision.de. 14 May 2011. Retrieved 28 October 2012. ^ "Tim Frühling: Protokoll eines Dramas". 18 April 2011. Retrieved 28 October 2012. ^ "Fréttablaðið, 12 May 2007". Timarit.is. Retrieved 9 August 2012. ^ "RTE so lonely after loss of Gerry – Marty". 20 May 2010. Retrieved 29 May 2010. He has been providing commentary for Irish viewers since 2000 and maintains great enthusiasm for the much lampooned contest. ^ "Eurovision Song Contest 2007". RTÉ News. ^ www.eurovisionartists.nl. "Welkom op de site van Eurovision Artists". Eurovisionartists.nl. Retrieved 9 August 2012. ^ DODAJ OGŁOSZENIE Ogłoszenie już od 200zł! (10 May 2007). "Eurowizja 2007 w Jedynce". Wirtualnemedia.pl. Retrieved 9 August 2012. ^ "Comentadores Do ESC – escportugalforum.pt.vu | o forum eurovisivo português". 21595.activeboard.com. Archived from the original on 21 April 2012. Retrieved 9 August 2012. ^ "FORO FESTIVAL DE EUROVISIÓN • Ver Tema – Uribarri comentarista Eurovision 2010". Eurosongcontest.phpbb3.es. Archived from the original on 17 March 2012. Retrieved 9 August 2012. ^ "Infosajten.com". Infosajten.com. Archived from the original on 18 July 2012. Retrieved 9 August 2012. ^ "Swedes stay at home with Eurovision fever". The Local. 16 May 2009. Archived from the original on 15 May 2013. Retrieved 29 September 2012. ^ Hoyler, Steve (23 April 2007). "The Official Eurovision Song Contest Album is here". esctoday.com. ESCToday. Retrieved 5 November 2014. ^ "Eurovision Song Contest 2007". Offiziellecharts.de. GfK Entertainment Charts. Retrieved 17 March 2018. Wikimedia Commons has media related to Eurovision Song Contest 2007. "Liubi, Liubi, I Love You"
"I Love You Mi Vida"
"Flying the Flag (for You)"
"They Can't Stop the Spring"
"Get a Life - Get Alive"